World champion Mark Cavendish may have to pay his own "release fee" to secure a move away from Team Sky. He has effectively been on the market since July, when Sky boss Dave Brailsford admitted they were probably not the best home for the sprinter. 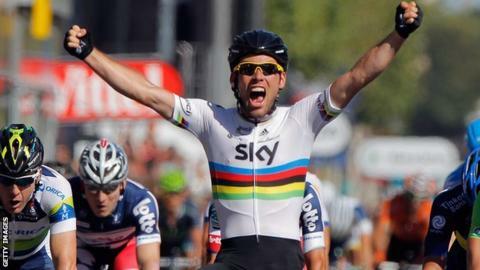 Sky are focused on overall victories in cycling's big races, instead of helping Cavendish, 27, win individual stages. An amicable divorce had looked likely but Sky have now made it clear they expect compensation for letting him go. There is no suggestion of regret on Cavendish's part at the time he has spent with Sky - he has enjoyed being part of a remarkable year for British cycling, even if the move has not worked out for him personally - but resentment could fester if the man French newspaper L'Equipe called the Tour's greatest sprinter is asked to fetch water for his team-mates again next year. "When a rider is under contract, it is common practice - and the industry norm - to pay a release fee," a Sky source told the BBC. That fee usually comes from the rider's new team but it can be paid by the rider, the source said, before adding that Sky compensated Garmin-Slipstream when Bradley Wiggins joined in 2010. Although Sky are one of the strongest teams in professional cycling, their target is to win the general classification in big races - such as Bradley Wiggins's yellow jersey in the 2012 Tour de France. This means they rarely have riders available to try to set up Cavendish, the world's finest sprinter, to win individual stages by leading him out and enabling him to hit the front with a few hundred metres to go and then speed to victory. With Cavendish already one of the highest earners in the sport - Sky doubled his salary to more than £2m a year when he signed last October - any suggestion of compensation could scare off potential suitors. The annual budget for most teams in cycling's ProTour circuit is less than £10m and must stretch to 26 other riders, as well as support staff, management, travel and other costs. Half a dozen teams have been connected with a move for Cavendish, but only three - BMC, Katusha and Omega Pharma Quickstep - have the financial means to add him to their squads. A figure of £1m for the release fee from Sky has been mooted. There have been no talks between Cavendish and Sky in the past six weeks, leading to varying degrees of frustration on both sides. Two weeks ago, Tour de France champion Wiggins acknowledged that Cavendish should leave the team for the good of his own career, but now Sky's riders have been told to stop talking about their star sprinter. Cavendish has so far kept his thoughts to himself. It is a testament to Cavendish that his 12 victories in 2012, including three at the Tour de France, are perceived to be a disappointment. But few in the sport expect 2013 to be much better unless he moves to a team with priorities that match his own. That said, Cavendish enters the final part of the season with real hopes of success at next week's Tour of Britain and the following week's World Championships in the Netherlands. The reigning world road race champion took some time off after his unsuccessful bid to win Olympic gold at London 2012, but used the Tour of Denmark to tune up for his busy September schedule and finished with victory in the final stage. He then rode a one-day race in Belgium on Monday before going home to the Isle of Man for some training on familiar roads. His preparations for what could be a defining fortnight have been boosted by the knowledge that Wiggins will be riding to deliver Cavendish to the bunch sprints he relishes, starting with the Tour of Britain's first stage from Ipswich to Norwich on Sunday.